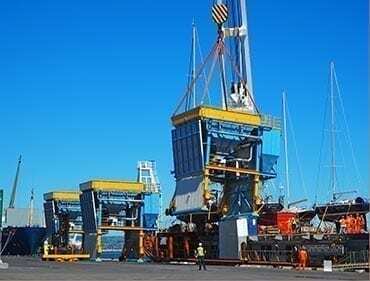 For a complete solution to satisfy your stakeholders, we deliver quality port equipment which is proven in the field. You can achieve environmental compliance, maximise your productivity, minimise maintenance costs and ensure safe operation for your people. 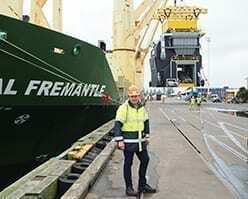 Port operators, stevedores, maritime and log logistics companies throughout Australia, New Zealand and the Americas are successfully using our port equipment in their operation. To achieve environmental compliance, maximise your uptime and ensure safe operation we have invested heavily in research, design and development. For clean fresh air and a clean port environment, we understand you need to comply with strict environmental regulations to eliminate dust emissions and spillage. Our innovative engineering solutions will help you achieve and maintain compliance. You can keep your downtime to a minimum with equipment which is easy to service with the backup of a technical support team and parts when you need them. We are committed to ensuring the safety of you and your staff with equipment which is designed to be safe to operate and easy to maintain. Wherever you are in the world, we can service your requirements. Our proximity to Port of Tauranga, New Zealand’s largest and busiest port, enables us to ship your equipment and parts directly to you. When you need to maximise productivity, protect the environment and keep people safe, we have the expertise and solutions. From the ships hold to the truck, wagon or conveyor, when you are discharging product, minimising dust and containing spillage is a priority. Our hoppers combine new and proven technologies, providing solutions that satisfy your environmental, safety and productivity needs. 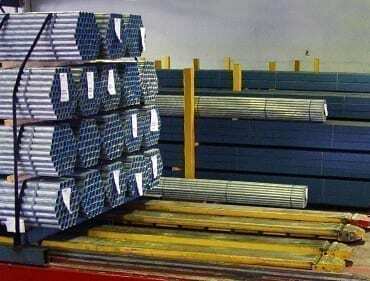 They are designed to handle a variety of bulk products from cement clinker to mineral concentrates. Building upon established product design, we use a rigorous consultation process to ensure your requirements are met. We’ll work closely with you, your operating staff, port authorities and other stakeholders to provide a solution to your cargo handling needs from ship to shore, industrial stockpiles or during trans loading to truck or rail. Our hoppers are operating with outstanding success for port operators, stevedores and maritime logistics companies in many locations throughout New Zealand, Australia and Peru. When you need to keep your operating costs to a minimum while maintaining high productivity and digging capacity, the Page Macrae Engineering Mechanical Wire or Chain grab provides the solution. A low centre of gravity allows the grab to be operated on steep cargo profiles without rollover, allowing for a safe, more productive discharge. 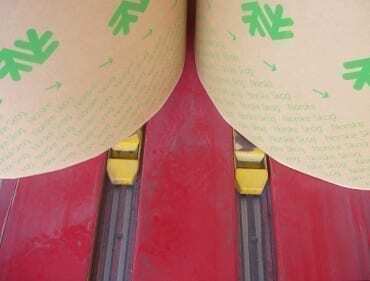 For difficult to handle cargoes such as soda ash and fertiliser, the overlapping blade seal and serrated bucket teeth minimise product loss and dust emissions, making the grab an ideal solution. 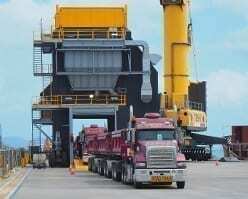 Port operators, stevedores and maritime logistics and mining companies in Australia, New Zealand, New Caledonia have entrusted our grabs since 1993. Now you can have the versatility of a conventional remote release grab with the infinite control of a diesel-hydraulic system. Radio remote control operation allows you to maximise productivity in an environment where dust emission concerns are high. 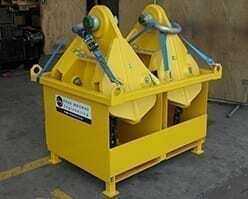 Our diesel hydraulic grabs are suitable for discharging a wide range of products including finely textured products like soda ash to high-density products such as mineral concentrates and clinker. 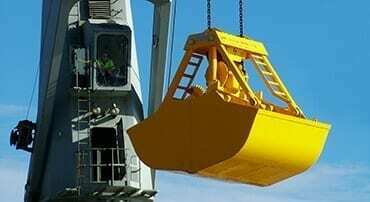 Our diesel-hydraulic grabs are designed to be reliable in the toughest conditions and will give many years of service. 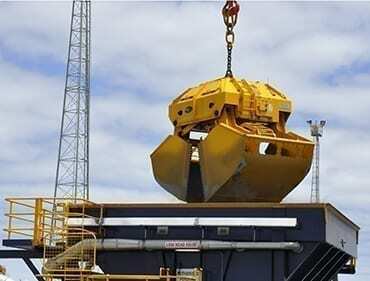 They are being successfully used by port operators, stevedores and maritime logistics companies in Australia, South America, New Zealand and further afield. 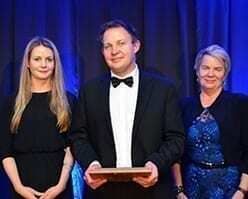 Page Macrae Engineering are recognised internationally and in New Zealand for our award-winning port equipment. Do you want to protect your staff from injury when loading bulk logs, increase your loading capacity and productivity at the same time? The Page Macrae Log Lifter – SRTM and Page Macrae Log Lifter-MRTM allow you to safely load up to 32 tonnes of logs in one manoeuvre without needing any personnel in the hold of a ship to unclip wire ropes. This eliminates the risk of injury and saves loading time. Our customers have experienced significant efficiency gains – up to 50% reduction in load time – compared to traditional loading methods such as wire ropes and hooks or grapples. Our Log Lifters have a simple maintenance schedule owing to the simplicity and ruggedness of the design, combined with fewer moving parts. Page Macrae Log Lifter – SRTM Utilising a single release mechanism, our flagship Log Lifter retains the wire ropes upon release readying it for the next loading manoeuvre. Page Macrae Log Lifter – MRTM Utilising a four and two hook release mechanism, this innovative multi-release design is ideal for loading scenarios where you require the wire ropes to stay in the hold for re-attachment when unloading at destination. We are proud to supply Log Lifters to clients in port operations, stevedoring, port logistics and forestry from many countries across the globe including Canada, USA, Australia, Brazil, Uruguay and New Zealand. Contact us now to discuss how our Log Lifters can help you improve the safety and productivity of your loading operations. When safety and efficiency is top of mind for loading and unloading containers, the remote-controlled Page Macrae Container Spreader provides the solution. 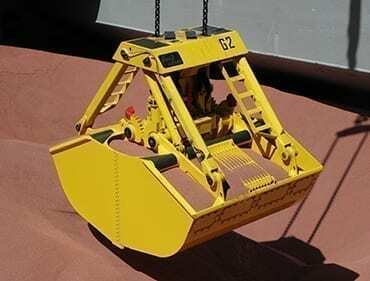 The diesel-hydraulic Container Spreader is purpose-built to automatically level containers with uneven loads – a sensor moving the ships hook connection along the spreader until the load is level. An onboard diesel-hydraulic engine generates its own power, eliminating the need of a connected system or a ship to shore power supply. Manufactured from pressed, high-strength structural plate, the container spreader optimises the load capacity to weight ratio minimising operating load stress to help reduce cycle fatigue. Port operators, stevedores, maritime logistics companies [and anyone else?] 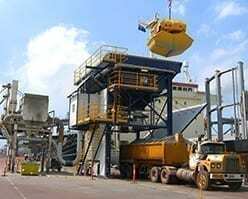 throughout Australia and New Zealand have successfully used our container spreaders since 20XX. You can safely and efficiently load and unload multiple bales of pulp with the remote-controlled Page Macrae Multi-Lifter. 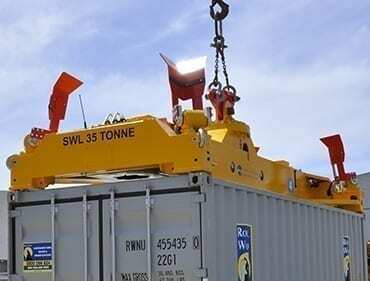 Designed to lift several pulp bales at once, your crane operator can safely release the load by remote control. Manufactured from pressed, high-strength structural plate, the Multi-Lifter optimises load capacity and minimises operating load stress to help reduce cycle fatigue. With 12, 15, 25 and 30-tonne options available, you can maximise your productivity with the multi-lifter best suited to your operation. Do you want a safe, quick way to load and unload shipping containers and truck decks while maximising load space? The Page Macrae Engineering Skate Table® is a safe alternative to conventional forklift handling methods for safely loading and unloading truck decks and containers. You can now remove your staff from the truck or container during loading and unloading to reduce the risk of accident or injury. The Skate Table® was developed as an alternative means to conventional forklift handling methods and is used by operators seeking an optimum method for container vanning, devanning and load transfers. With the Skate Table®, the speed and ease with which your containers and trucks are loaded and unloaded ensure your team can maintain high levels of productivity. Once the skate is loaded, you can load and unload a full truck or container in around two minutes. 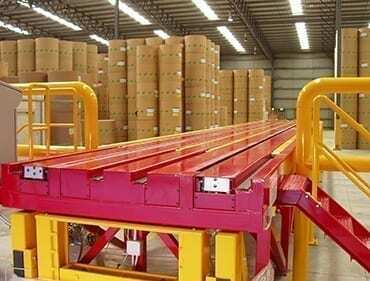 Improved turnaround times help reduce pressure on your equipment and warehouse space. Using the Skate Table® for your operation allows maximum utilisation of container and truck space. 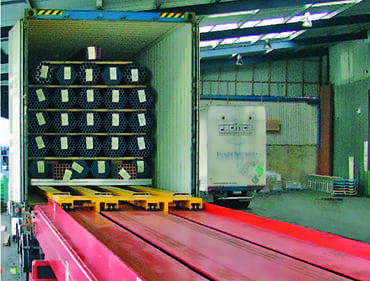 The load can be stacked to full height because it is placed on the Skate Table® loading platform and then slid straight into the container or truck. The Skate Table® reduces loading damage to goods by providing a loading/unloading platform allowing unobstructed access. Forklifts never need to enter the container or truck.